After a steady decline in production, an operator working in the Wabamun formation needed a solution for enhancing production from old wells and effectively extracting resources from new wells in the area. Early horizontal wells in the carbonate formation’s development resulted in an average initial 2-month production rate of 3,875 boe per month. During the next 9 years, the average production rate decreased to 492 boe per month. The Swalwell oil pool, part of the Crossfield member of the Wabamun formation in southern Alberta, is almost 40 km2 (15 sq. miles) and holds an estimated 87.5 million bbl of original oil in place and 85 Bcf of solution gas. Oil production from the Wabamun is low compared to other Devonian producing zones in Alberta, and even a small increase in recovery factors would yield substantial increases in production. Thickness of the heterogeneous reservoir averages from 10 to 15 m (33 to 49 ft) and the more permeable horizontal sections, or sweet spots, are vertically separated in a tabular fashion. The general matrix permeability ranges between 0.1 and 0.3 mD, but within the higher porosity zones permeability can exceed 100 mD. Although the general matrix porosity averages 7%, streaks of 8 to 12% exist throughout the reservoir. Historically, an acid wash was used to clean out near wellbore damage, which would only exploit the intersecting high porosity sweet spots. By adopting acid stimulation techniques to access the tabular zones above and below the reservoir, the operator anticipated improved production results. The operator tested a progression of different completion configurations and diversion methods on old wells and new drills in the formation to determine the most effective stimulation technique. The first method involved bullheading acid into three existing wellbores. Despite increases in production of 1.5 to 2.7 times greater than pre-treatment rates, this method was incapable of directing stimulation to a specific section along the horizontal wellbore because the acid naturally diverts to the area of greatest permeability. Bullheading acid into the wellbores resulted in incomplete stimulation of the reservoir and proved not to be cost effective, which prompted further examination on improving acid completion treatments. The operator’s next five wells were completed using a 5-stage Packers Plus RapidMATRIX® system, including 17 RapidJET™ nozzles. Two of these wells were new drills and the other three wells were recompletions, previously acid washed with coiled tubing. In all five wells a viscous gel solution was pumped into the annulus to isolate the wellbore and complete the wells in multiple stages. 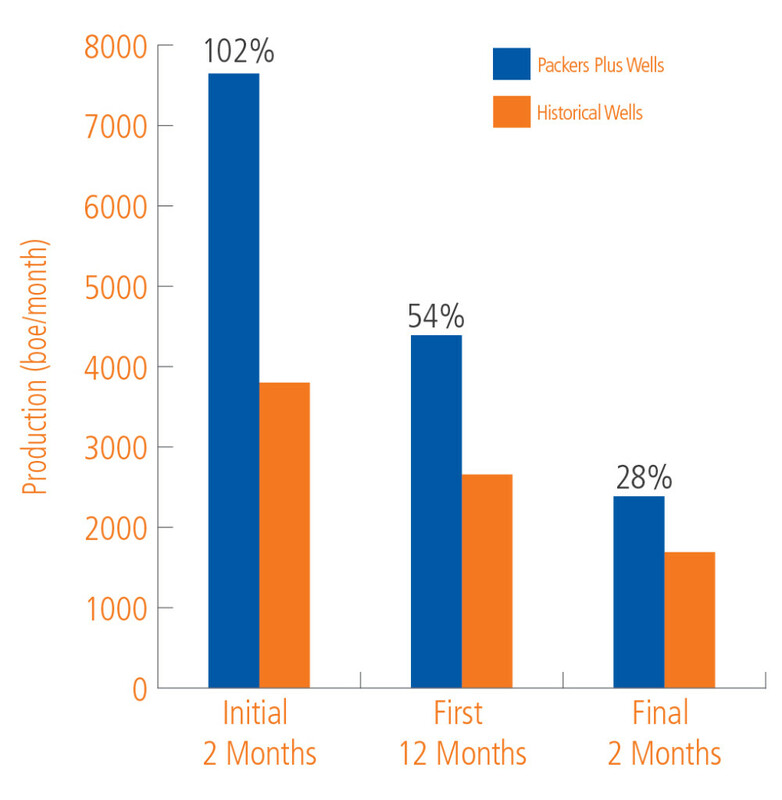 Despite an inability of the gel diversion to isolate the completion fluid in the annulus for all stages in the two new wells, initial production rates increased 77% and final production rates increased 12%, compared to historical well production in the Swalwell pool. In an effort to improve stage isolation, a hydraulically set Liner Hanger Packer was used in the three recompleted wells. Although the operation was restricted to half of the desired treatment rate, the three recompleted wells were successful. The first returned to its original initial production rate and the other two wells increased their current production by 1.5 and 2.4 fold. To further improve effectiveness of the multi-stage acid completion treatment, the operator decided to use RockSEAL® II hydraulically set mechanical packers, instead of gel diversion, to isolate sections of the lateral. Using a combination of Packers Plus RapidMATRIX and StackFRAC® technologies, a 6-stage system was designed to allow for maximum pump rates in all stages. The first three stages included 15 RapidJET nozzles and covered 65% of the horizontal. The last three stages included a single FracPORT™ per stage and covered 35% of the horizontal. Implementing Packers Plus completion systems with RockSEAL II mechanical packers resulted in significant initial and final production rate increases, compared to historical production values from the area. Average initial production rates were 102% higher and average final production numbers were 28% higher. Considering historical wells were drilled early in the pool’s history, the original wells had the advantage of higher reservoir pressure. In contrast, the newly drilled wells had the disadvantage of reservoir pressure that depleted by approximately 15%, which makes the production rate increases compared to the historical wells even more significant. Operators seeking to increase efficiencies in unconventional oilfields rely on innovative solutions. Packers Plus continues to design advanced technology to provide operators with efficient and cost-effective systems to complete their open hole, multistage horizontal wells. RapidMATRIX and hybrid RapidMATRIXStackFRAC systems have been run worldwide, allowing operators to successfully exploit a variety of tight carbonate reservoirs.